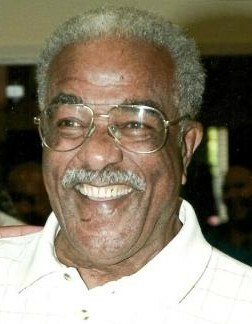 Bulah Joshua Strother, 93, affectionately known as “Boots”, or “BJ”, or everyone’s “Uncle Boots”, departed this life Saturday, March 30, 2019. He was born in Cadiz, Ohio to Bulah and Zella (Tyler) Strother on August 17, 1925. He was one of 11 children. He spent his formative years there with his brothers and sisters, and was an outstanding football player who set records that remained unbroken for many years following his departure from Cadiz. His Mother gave him the nickname, “Boots” because he enjoyed wearing them and often wore those that were too big for his feet. He enlisted in the United States Army in December of 1943. He served in the 586TH Transportation Company that ran supplies to the front lines and was honorably discharged in April of 1946. Following his service in WWII, he met and engaged to marry Rachel Kinley. After their marriage in November of 1949, they chose to reside in Springfield, Ohio, and had 3 children (daughters, Jocelyn and Janine, and son, Jeffrey). Boots and Rachel were married for 48 years before her death in 1998. He was a strong Christian man, who always placed God’s Will far ahead of his own. He served in many different areas at the former Broaddus United Methodist Church (since merged with Wiley UMC and is now Covenant United Methodist Church). He was the “jack of all trades” for many productions at Broaddus that his belated wife, Rachel, put on over the years. He was involved in many charitable pursuits and as an active member at Covenant. He served as a member of the United Methodist Men, a trustee and on the Usher Board. He also served at the Open Hands Free Store and volunteered at Springfield Regional Hospital. He was employed for 12 years by Ohio (Teledyne) Steel until its closure and then by O’Cedar/Vining Broom from which he retired twice. He was totally devoted to his family. He was always there for his children and grandchildren and was a humble man. He leaves to cherish his memory his daughters, Rev. Dr. Jocelyn Roper, Englewood, Ohio, Janine Dogan (Darryl) and his son, Jeffrey Strother (Djakata), both of Springfield, Ohio, and Jesse Roper I, son-in-law, Springfield, Ohio. He was affectionately known as “Poppy” by his 7 grandchildren, Joshua Roper (Tawana), Columbus Ohio; Jesse Roper II (Latoya), Canton, Ohio; Jasmine Roper (Ebrahim) of Phoenix, Arizona; Jared Roper, Englewood, Ohio; Jeannette Roper, Dayton, Ohio; Keith and Olivia Strother (Springfield); and four great-grandchildren, Justus, Talya, Mahnyima and Jada; a sister, Bertha Ingram of Cleveland, Ohio; brother, Keith (Earnestine) Strother of Cleveland Ohio; many nieces, nephews, cousins and friends; special friend Ms. Ruth Stone; and lifelong friends, Mrs. Dorothy Leath, Mrs. Minnie Davis and Mrs. Maxine Nolcox. He was preceded in death by his parents; wife, Rachel; sisters, Beatrice, Emma, Geneva, Ida, Jayne, Martha; and brothers, Edgar (Peck) and William. We will profoundly miss him telling us to “Watch your fingers in the car door” or, “Watch your step”. This was his way of showing us that he cared after we became adults, because he never let go and we were still his children. Even until his last days, he worried about us. He now has no worries and he can rest in peace knowing that he taught us well and we will continue to carry his legacy. He is now resting in honor, peace and love in God’s Kingdom. Visitation will be held at 5:00 p.m. until the time of service on Friday, April 12, 2019 at Covenant United Methodist Church, 529 West State Street, Springfield, Ohio 45506 with funeral service beginning at 7:00 p.m. Interment will take place Saturday, April 13, 2019 at 10:30 a.m. at the Soldiers Mound in Ferncliff Cemetery with Military Honors. Arrangements entrusted to the care of the Jerry W. Kinley Funeral Home.